A restored barn full of character with stone walls and huge wooden beams. It is set in enclosed grounds with a roofed patio area, barbecue and garden furniture. The accommodation comprises of an open plan lounge/kitchen/dining area with modern appliances including a cooker, fridge, freezer, washing machine, ironing facilities, television and a double sofa bed. There is a double bedroom and a separate shower room on the ground floor, whilst upstairs has an open mezzanine bedroom with two single beds. 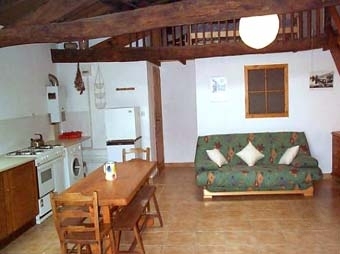 The gite is heated by a woodburning stove. To book, please phone or email to confirm availability, and then complete the booking form.